Sponsored by the IEEE Magnetics Society. Abstract: The introduction of artificial magnetic structures into magnetic materials can induce novel electromagnetic and spin-wave behavior. Nano- and submicrometer-scale artificial magnetic lattices (AMLs) can control optical (electromagnetic) waves in magnetophotonic crystals, volumetric magnetic holograms, and labyrinthian magnetic domain structures, and can affect spin waves in magnonic crystals. In this talk, the fundamental properties of such AMLs, mainly in magnetic garnet films and alloy thin films, are discussed, followed by demonstrations of their applications in optical and spin-wave micro-devices driven by magnetic phase interference: volumetric magneto-optic (MO) hologram memories and three-dimensional MO holographic displays with magnetophotonic crystals; high-speed MO Q-switch micro-chip lasers with iron-garnet films with labyrinthian magnetic domain structures; and highly sensitive magnetic sensors and spin-wave logic circuits with magnonic crystals. Prospective future spin-wave devices with AMLs will be discussed in the context of the new paradigm of magnonics (electron non-transport electronics), where spin waves play an important role as the information carrier. Bio: Mitsuteru Inoue received the B.S. degree in information engineering and the M.S. and Dr.Eng. degrees in electrical and electronic engineering in 1981, 1983, and 1989 from Toyohashi University of Technology (TUT), Japan. He was an associate professor at TUT from 1993 to 1996, and with the Research Institute of Electrical Communication, Tohoku University, from 1997 to 1999. From 2001 to 2013 he served as professor in the Department of Electrical and Electronic Engineering, TUT. Since 2014 he is jointly serving as professor of the Graduate School of TUT and as an executive trustee and vice president of TUT. He was a visiting professor at Stanford University in 2003 and at Moscow State University in 2004. His research interests include spin-coupled wave propagation phenomena in amorphous alloy and magnetic garnet thin films, including phase modulation of magneto-surface-acoustic-waves, control and phase modulation of optical waves, and control of high-frequency magnetostatic and spin waves, together with their applications in magneto-optical (MO) spatial light modulators, three-dimensional MO displays, non-destructive MO imaging, magnetic hologram recording, and spin-wave logic circuits. Prof. Inoue has served as the director of Magnetics Society of Japan from 2013 to 2015 and as the general chair of the Magnetics and Optics Research International Symposium (MORIS, 2015 and 2018). 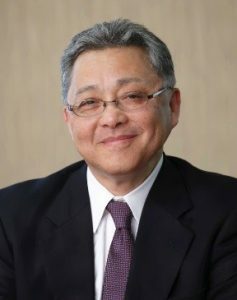 He is currently the chair of the 147th Committee on Amorphous and Nano-Crystalline Materials of the University-Industry Cooperative Research Committees, Japan Society for the Promotion of Science (JSPS).